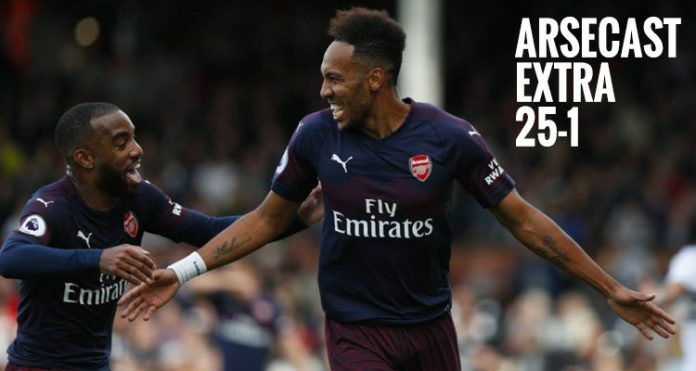 On this week’s show we enjoy the 5-1 win over Fulham, two goals each for Lacazette and Aubameyang, a truly beautiful goal of the season contender from Aaron Ramsey, some tactical flexibility from Unai Emery as he goes 442 (something for the Sodastream generation to enjoy), and the fact we’re now in the top four and ahead of Sp*rs. Then we answer questions about our summer transfer business, Lucas Torreira’s quality and his song, our calls for best player of the season so far and biggest surprise, what does Emery do with Petr Cech when he’s fit again, goal celebrations and lots more. Previous articleFulham away: Can Emery find the right balance?